We meet on Monday Nights in the Parish Hall from 6:30 PM – 8 PM starting on September 17, 2018 and running through April 29, 2019. Please CLICK HERE to view, download and print a PDF version of our 2018-2019 EDGE Middle School Youth Ministry schedule. 2019-2020 EDGE Program Year Registration Dates/Times to be Announced after Easter! 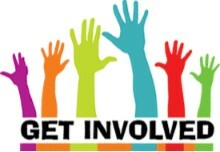 If you have questions about registration or our EDGE program, please contact Angela Quintanilla at (210) 695-8791, Ext. 116 or via email at AQuintanilla@olghelotes.org. 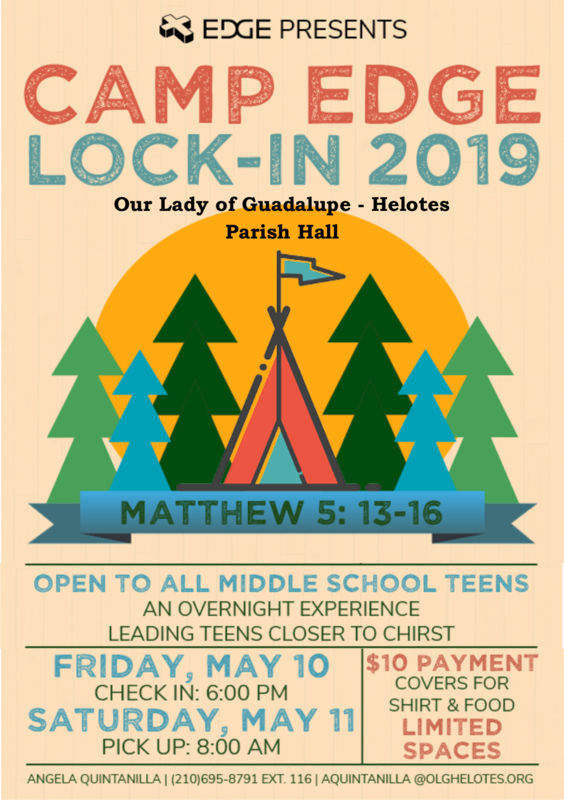 The Middle School Lock ­In is an overnight experience created for sixth, seventh and eighth graders designed to take place on the parish grounds. The middle school youth will learn more about their Catholic faith and be challenged to grow deeper in their relationship with Jesus Christ. This is a free event and takes place in the Parish Hall. Registration forms are available at any EDGE Night (Mondays) OR at our Parish Office during regular business hours (Mon.-Fri.; 9AM-5PM). Parish office will be CLOSED on Friday, April 26. We will organize many opportunities for youth and families to serve Our Lord by being His hands and feet within our parish, local and extended community. Project dates and descriptions are coming soon. Last year, the Edge participants had an opportunity to complete over 52 service hours to various projects and foundations. Our EDGE Middle School Ministry is looking for parents of middle school kids, other adults, and high school juniors and seniors to minister to our middle school youth on Monday Nights. There are many ways you can help. Please consider helping to share God’s message with our middle school youth. CLICK HERE to learn more about how you, too, can volunteer! I am excited and humbled to serve another year as the Middle School Youth Minister at Our Lady of Guadalupe. I am looking forward to all the wonderful plans God has for our parish community, parents and preteens! I will be praying for you and your families. I have an open door and I am here to serve with all of God’s love. Feel free to contact me with any questions or if you are interested in getting involved. Please remember to pray for us: the youth and volunteers. To give us knowledge, courage and a willing heart to be the disciples of today. To learn God’s will, to share God’s message and to be God’s people. To bless us with happiness, friendship, love, laughter, peace, faith, hope, achievement and direction. "Good and loving Creator, you are the author of all that is good and holy. We ask you to send your Holy Spirit upon our middle school youth and bless them with your patience, inspire them with your joy, and nurture them with your compassion. In their journey to follow Jesus, encourage them with holiness and peace. In times of confusion and uncertainty, guide them with your wisdom and truth. May they always look to you for strength and guidance. We also ask you to send your blessing upon EDGE. Allow it to always be a source of inspiration, acceptance and love. May all those who minister in EDGE walk always in the light of Christ and bring our young people ever closer to your son Jesus. We ask this through Christ our Lord." Amen!